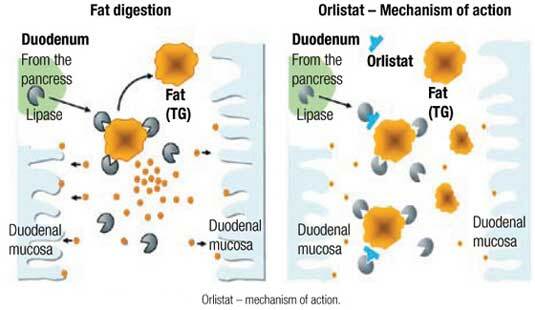 MedExpress > Medicinal Products > Orlistat > How Does Orlistat Work? Orlistat is a medicine that helps obese people lose weight. Normally, fat from your diet is broken down by enzymes in your stomach and intestines and absorbed into your body to be stored. 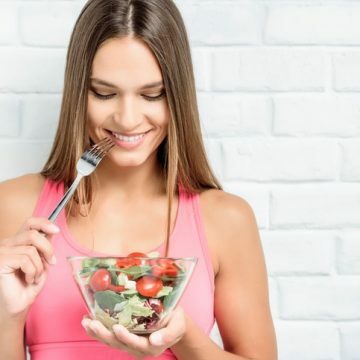 However, Orlistat stops these enzymes from working – this means 30 to 40 percent less dietary fat will be taken up by your body. Instead, the unabsorbed fat will pass directly through your digestive system. Orlistat isn’t effective for everyone and is by no means a miracle weight loss pill. Orlistat is recommended if you are overweight and if previous weight-reducing efforts have not worked. As long as you follow a sensible, balanced diet, as well as exercise regularly, you’ll have a good chance of losing weight. 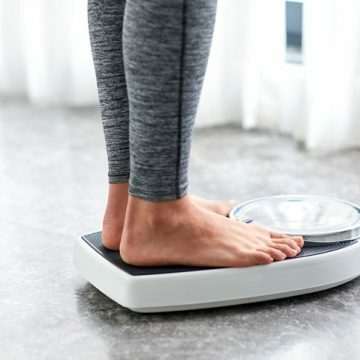 In clinical trial data, the average weight loss was 50 percent extra with Orlistat in comparison to placebo with diet. This means that if you could lose 6 kg with diet alone, you could lose 9 kg with Orlistat. Furthermore, it was shown that those taking Orlistat maintained weight loss better than in the placebo group. For maximum effectiveness of Orlistat, one capsule is taken with each main meal (a maximum of three capsules a day) before, during, or up to one hour after each meal. If you miss a meal or the meal does not contain any fat, you do not need to take the capsule. Orlistat is available in two types: Xenical and Alli. Xenical is the prescription dose (120mg) of Orlisat, while Alli contains half the amount (60mg) and is available to buy over-the-counter. Both treatments target and remove fat in exactly the same way. Take one capsule within an hour of eating each of your three main meals. One at breakfast, one at lunch and one at dinner. You should continue taking Orlistat for at least three months in order to see if you’re effective in losing weight. If you’ve failed to lose any weight, most doctors will advise you to stop taking Orlistat. If you’ve been on Orlistat for a year, we advise you to discuss the potential benefits and limitations of continuing to take Orlistat. Know that weight loss takes time. Have realistic goals in mind, monitor your progress and don’t give up! 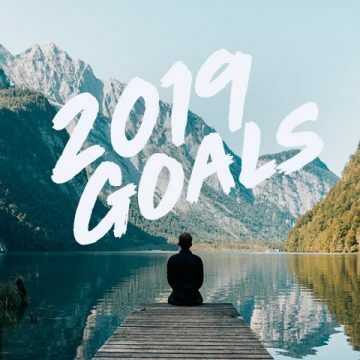 Successful weight loss depends on realistic, achievable goals. When you start taking Orlistat, your first weight loss target should be to lose five percent of your weight in the first three months. 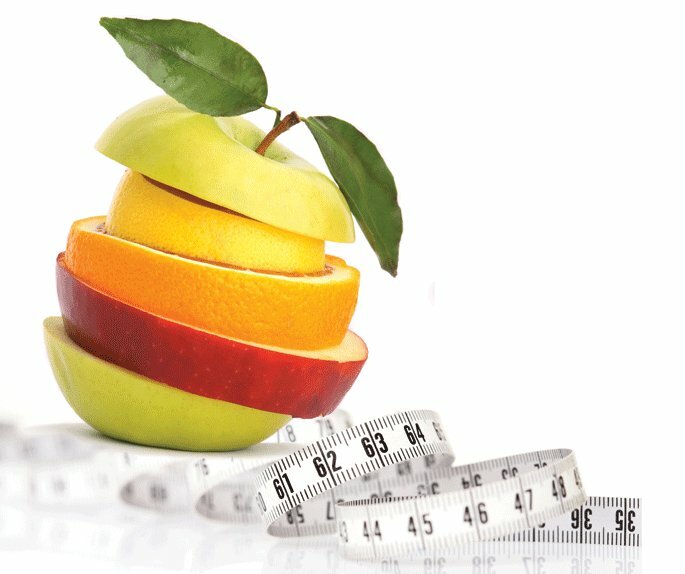 If you succeed in losing the weight, you’ll be able to continue with the treatment. However, don’t be disheartened if you don’t lose weight with Orlistat. After a break of six months, you can try again. These symptoms often improve after a few weeks when your body’s adjusted to the new medicine. How will Orlistat effect other medication? As Orlistat affects absorption into your digestive system, other medications may be affected, especially if you experience diarrhoea. It’s very important to check with your doctor or pharmacist first before taking Orlistat if you’re taking other medications, such as the oral contraceptive pill. Yes! You can take vitamins if you’re taking Orlistat as most are fat soluble and not absorbed well when you take Orlistat. These are vitamins A, D, E and K. It’s strongly recommended that you take a multivitamin containing these vitamins at least two hours before or after you’ve taken Orlistat. Most doctors recommend you take your multivitamin at bedtime. Decided to purchase Orlistat? Next step might be to work out your diet. Try our Orlistat diet plan.